Over the last year the CRSF has been implemented in even more TBS gadgets. Now you can find it in the Taranis, the Core and now in Betaflight. What´s new is the use in BetaFlight. Actually only the RC Datas will be send but PID´s and FC Settings will might follow. used Capacity, Flight Mode and the Angle of you axes. In this article i´ll use the TBS COLIBRI FC but you can do this with every FC that you like. a free UART Port (without inverter). Now you need to connect Pin 7/8 (Diversity RX) or Pin 1/2 (Micro RX) to the UART of your FC. 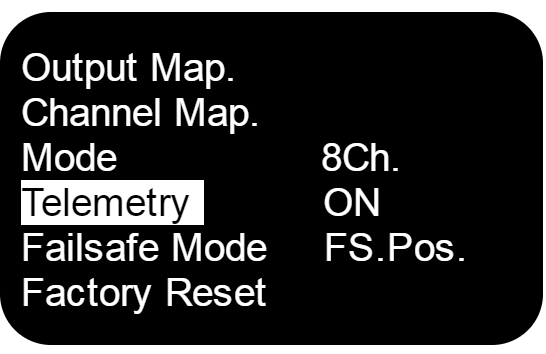 At the moment there is no way to use the telemetry if you have a Micro RX V1. Within the next updates for the Crossfire it should be possible to use the CRSF protocoll and the Telemetry by the BST connection. The COLIBRI FC hase only the RX Pin on UART 2. So for now you need to use the UART 3 Pin´s. On the Cueb PDB V2 an on the FPVision you can still use UART 2 as the RX and TX are avalible on the bords. If you what to use it that way you need t get a separate power and ground connection for your rx – e.g. by the BST. When you installed all the connections it´s time to set the crossfire up for it. Depending on your RX you need to configure the right pins for the serial protocoll. On the Diversity RX you only need to set Out 8 to CRSF TX, on the Micro V2 Out 1 to CRSF TX. 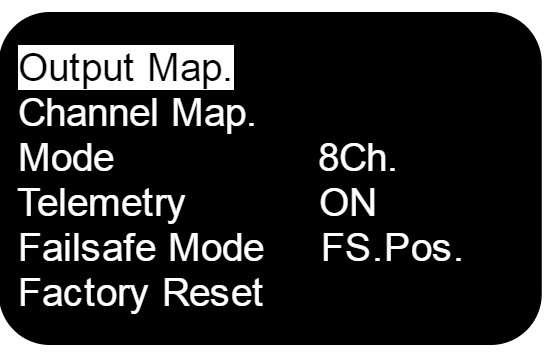 The RX channel will be configured automaticly. To get the full potential of the CRSF protokoll you need to enable the telemetry. While the transmitting speed is set automatically by the Quality of the link you can´t set the Speed manually. This is the reason why the settings for “SBUS Rate” is no longer available. The Crossfire always use the highest refresh rate possible. To maximise the speed of the transmission you also shall set you channel number to 8 if you don´t need 12. The last thing you need to set up is Betaflight. Therefore you need to connect your FC with the PC and open the Betaflight app. First you need to configure the port. Disable “Serial RX” on UART 2 and enable it for UART 3, save. Now go to “Configuration”, select “Serial-based receiver” and selcet “CRSF” as provider. Now where all Settings are done it´s time to serach for the seonsors. 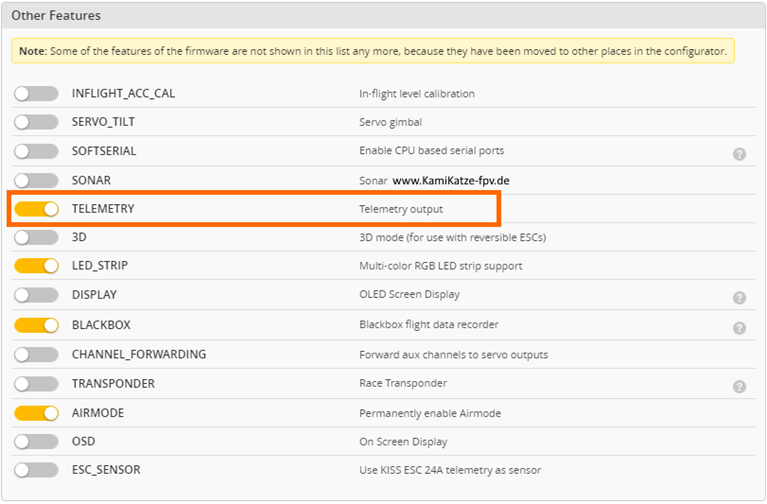 Open the Taranis menu an go to “TELEMETRY”. Click on “search sensors” and wait a moment. If you already done it before you´ll need to delete the old sensors and reedo the search. The new Sensors are: Curr, Capa, Ptch, Roll, Yaw and FM. Actualy this datas will be updated ons per second what´s not pretty fast but might will become faster in a future update. In the older Core Pro/ FPVision firmware the crsf/bf code was not implemented. This problem is fixed in the latest firmware versions. So if your OSD says “unknown protocol” you should update your OSD to the latest Beta firmware. A nother problem that you might discover: The Core Pro/ FPVision can´t find your rx even with the latest firmware and all your wirings are ok. This happens because the OSD waits for a input on UART2. If you used UART 3 or 1 you need do go in the OSD menu under GENERAL/ FLIGHTCONTROLLER/ CALIBRATION/ RC CALIBRATION/ GET DATA FROM FC. Now your Core pulls the informations (endpoint, channel order etc) from your fc. have you tryed t errase the sensors and let it search again? the crossfire tx itselve should provide more sensors. This tutorial saved me once, Thanks ! …. but after a update … it doesn’t work anymore. I’m using Crossfire on the latest firmware (V2.11), Micro Rx, Elite Bundle on 2.01 for the OSD and Betaflight 3.2.1. I get a message (waiting for CRSF). I did set CRSF in both the Micro RX and Betaflight. I tried both uart 2 and 3 in betaflight, but none worked. I tried the AC Calibration with Read Cleanflight RC Data … didn’t work either. Do you have any idea where the issue might be ? you can- if you have a osd that support it – like the minim osd or a core por/ fpvision. if you switch to crsf it´s nothing else than switching from ppm to sbus. your fc will decode the signal and let you navigate throu the osd like bevore. not yet – if you mean the setup with a bf fc. Any update on pids and vtx-control via crossfire?